They were the Fab Four, the group who transformed the music scene and inspired a whole generation in the Swinging Sixties. The Beatles were one of the world’s most potent pop phenomena and ever since Please Please Me stormed to the top of the charts in 1963, they produced hit after hit, memory after memory: Yesterday, All You Need is Love, Hey Jude, She Loves You, Eleanor Rigby, Here Comes the Sun, I Want to Hold Your Hand, A Day in the Life….the list goes on and on. And yet, this lustrous quartet only rose through the ranks after paying their dues and embarking on a peripatetic tour of their homeland. This encompassed all manner of little gigs in small communities to which the now-fabled Lennon and McCartney, with their friend, George Harrison, travelled in a basic camper van. Luxuries there were not! 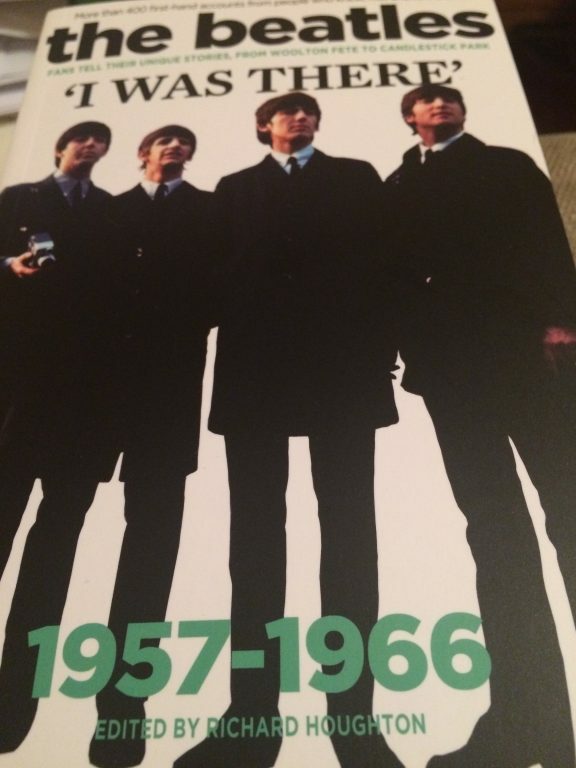 Richard Houghton has delved into their world, both before and after they became famous, and has just published his latest book The Beatles: I Was There, covering the period from 1957 to 1966, which is a genuine labour of love. He has amassed the anecdotes of more than 400 people who encountered the Mersey group on their mesmerising journey from the skiffle days as The Quarrymen, through to their thrilling early appearances at the Cavern Club in Liverpool and thereafter on to their emergence as global behemoths. The book captures a special time in rock history and commemorates a litany of catchy tunes and precious vignettes, encapsulating everything the world’s most famous group ever wrote. And it celebrates the reasons why so many loved the Beatles. In these days, there were no TV appearances or autograph-signing sessions. They were often the third or fourth names on the concert posters, and were paid with £10 here, £15 there, offset against petrol and lodgings in basic B&Bs. But they persevered And there are many fans, who were then in their teens and are now 65 or 70 – or older – who have never forgotten their first trysts with the group. There were times when they contemplated throwing in the towel and finding “proper” jobs. But mercifully, they persevered and eventually gained their reward. Scotland loomed large on their schedule as they strove to break into the charts. So it’s hardly surprising that Houghton managed to track down myriad voices from the north east who saw The Beatles. On January 3, 1963, they performed a gig in Elgin, which wasn’t a sell-out. Yet Adeline Reid will never forget the experience, nor her meeting with Lennon at his cheekiest. As she said: “I was a student nurse, training at Dr Gray’s Hospital in Elgin. I lived in a boarding house not far from the Two Red Shoes Ballroom. “The landlady was very genteel, she was aloof and did not tolerate bad manners. We were her girls. “Next door was another boarding house whose owners were friends of Albert Bonici, the owner of the Two Red Shoes. All the artists who appeared at the ballroom stayed there and it was an exciting time. “And then along came The Beatles and, seemingly, their appearance at the Two Red Shoes did not go down too well. My friend Joan and I were unable to get tickets, which were 4/6 – about 23p in modern money and quite an expense in these days. “However, when I was about to go to hospital for work the next day, The Beatles were hanging out of the window next door. I could have reached out and touched them. “Their personalities were cheeky and outrageous and not what we were used to at all. I thought they were fun. John Lennon asked me to take his pulse. And my face went the colour of a tomato. At the house door, our landlady suddenly appeared, who proceeded to reprimand them for their cheek. She did not approve of them talking to her girls in such a shocking manner! Fraser Gow was just 18 when he saw the band at the Town Hall in Dingwall on January 4 in 1963. “I worked for the Milk Marketing Board. I had another two mates with me that day. “We always went up the road to what they called the Pavilion in Strathpeffer and we thought: ‘We’ll go and see what these guys are like.’ I reckon there were about 20 of us there in total. It was pretty empty. This was the Beatles, the masters of melody who eventually changed the entire course of music history. But on some nights, they weren’t merely ahead of their time, but performing to sparse crowds whose mood often ranged from indifference to hostility. Billy Shanks was just 17 when he trotted along to that Dingwall gig. He said: “They weren’t very well known at the time. I didn’t know anything about them. It didn’t register that they had recorded ‘Love Me Do’. “And the funny thing is that when I went in the door to go upstairs, the doorman said: ‘Before you pay, go up and have a listen’. And I looked in the door and thought: ‘No, no, it’s not my type of music.’ I walked out and went to the local village hall five miles away to hear The Melotones. The words reflect the underwhelming impression which The Beatles made on many listeners in these early sojourns. And then you come to the aficionados who attended the Fab Four’s only gig at the iconic Beach Ballroom on January 6, 1963. Once again, they weren’t the headline act and there were even reports that some of the crowd booed them. The majority loved it, though, including a young Norman Shearer, who was in a local band The Facells. As he recollected: “The concert was terrific, but not for all of the audience. There are still silly rumours that they were booed off the stage, but that is palpable nonsense. “They were well received by the bulk of the listeners, and I still have a very clear picture in my mind of John Lennon standing on the stage with his guitar slung square across his body belting out Johnny B Goode and Roll Over Beethoven. “My impression was that they were great. My mate, Ian, was also there, sitting with his girlfriend near the front. He remembers that they finished with Love Me Do and then the curtains were supposed to close. Elsewhere at the venue, Liz Wilson was also luxuriating in a once-in-a-lifetime event in the Granite City. As she reminisced: “I remember it being a freezing night and my friends and I were huddling in the entrance, waiting for the doors to open. “While we were queuing, four scruffy-looking guys approached us to enter. The door was locked, but they were really nice and I loved listening to their funny accents. “We spoke to them while waiting for the attendants to unlock the door and we found out they were the act for the evening. So we chatted excitedly about meeting the guys, wondering if they were going to be any good. “Little did we know what we were about to witness. When they came on stage, wow, what a transformation! Gone were the four scruffy guys and there stood the Beatles, wearing cute suits with their identical haircuts. The myriad stories in Richard Houghton’s work are priceless. You really had to be there! The Beatles: I Was There is published by Red Planet, priced £15.99.